With the Pressing Tools PDF Pattern from Love U Bunches you can make a miniature set of pressing tools that will help you press small doll clothes perfectly every time! You can make the seam roll and pressing ham in an afternoon. It's a quick project that you will use all the time for perfectly pressing little seams and necklines. 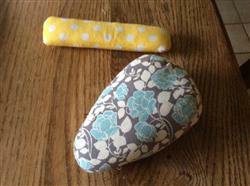 Pattern also includes instruction for using pressing cloths, for ironing a variety of fabric types. Easy pattern. I made the pressing ham and the seam roll; both items have greatly improved the overall results of my doll garments. Perfect fit for pressing tiny pant legs, shoulders and collars. What a brilliant idea!! Hardest part was getting the sawdust.. Very helpful with small spaces.. Thinking I will make a set for all friends making doll clothes. I am so glad I got this pattern. 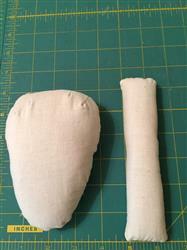 The tools have been so helpful in pressing the small seams and curves of doll clothes. The sawdust filling that's recommended is perfect for molding to subtle curves. I was able to get the sawdust free from a local store. Win! Win! These are really helpful when ironing doll-size items. I cut one of each shape in muslin and fashion fabric. I stuffed the muslin with the sawdust and finished as instructed, then used the fashion fabric as a slipcover over the muslin form. I wanted to be able to recover if needed. Love these! Went together so FAST AND LOOKED GREAT.